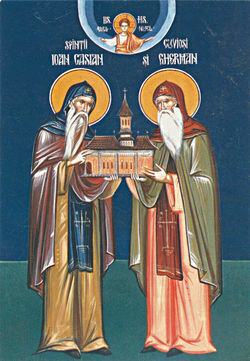 Our venerable and God-bearing Father Germanus of Dobrogea (known as Gherman in Romanian) was a chosen vessel of divine works in the fourth and fifth centuries in the land of ancient Scythia Minor, an area which previously had been traversed by the steps and words of the Apostle Andrew. His feast day in the Church is February 29. St. Germanus lived in the eremitic places of Syria, Palestine and Egypt and was granted the grace of priesthood at the hands of St. John Chrysostom. He returned to the lands of Dobrogea, renewing the monastic life there. He was a friend of St. John Cassian, who calls him "The holy father Gherman" in his writing. St. Germanus fed from the wisdom and richness of his spiritual gifts the souls of those searching for God and Christian perfection. This page was last edited on October 24, 2012, at 16:03. This page has been accessed 2,813 times.